BLADE: This is 1095 carbon steel clay tempered blade. The clay temper procedure is really complicated, and the way we use is the ancient clay temper craft.the blade will be set apart as 2, one is the back of the blade and the other is the cut edge side. the back side will be stick with the clay and the other side will be covered by the powder and other mixture which is protected as a secret recipe.coz the different thickness of the back of the blade and the cut edge side,and the different of the clay mud and the mixture,when the blade cooling to be a same low temperature at the same time after the heating by high temperature,that is why the blade has a radian,and there is a clay temper wave line. TSUKA: The Tsuka (handle) is made of hard wood(wider on the 2 ends and thinner in the middle of the handle), tightly wrapped over Genuine Samegawa (Ray skin) with Silk Ito. The Fuchi (sleeve) and Kashira (buttcap) are made of Alloy. The Tang of the sword is secured by two Mekugi (pegs). Two Menuki (ornaments) are on each side of the Tsuka. TSUBA: the tsuba is used to protect your hand from sliding onto the blade during thrusts. HABAKI(blade collar): is a one piece brass construction. 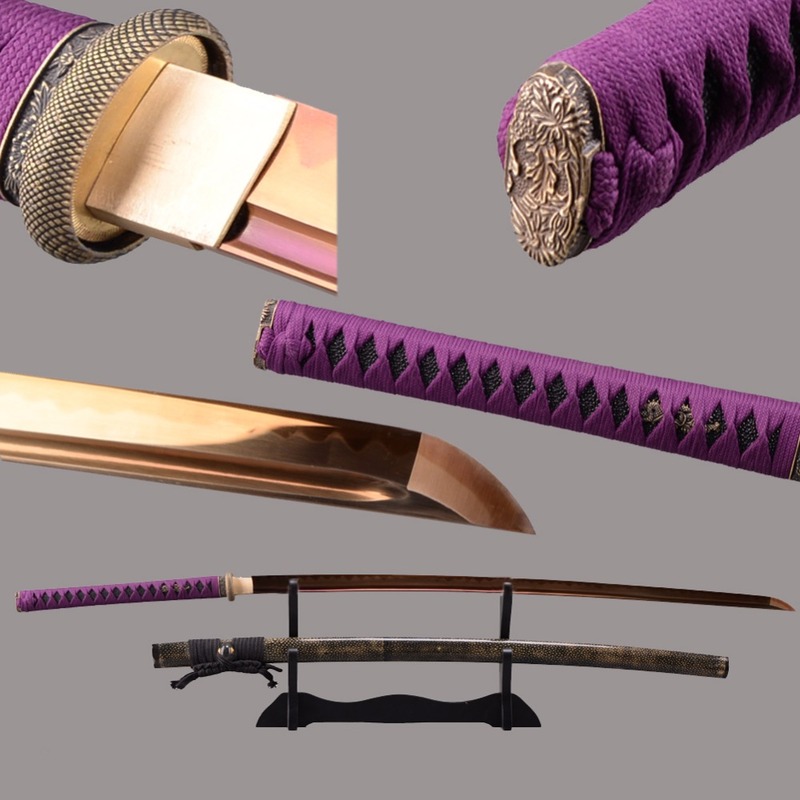 the main point of the habaki is to make the saya tight to the blade,so it is normal if there is scratch on. SEPPAS(spacer): Two Seppas secure the Tsuba( if the tsuba is not so tight after a long time,you can disassemble the sword and put more seppas there. SAYA: The saya (sheath) of the sword is made of hardwood, fully wrapped with real rayskin, tied with thick Sageo and real horn Kurigaga (knob) of the scabbard. 2. The pictures we show are 100% Real Object Photography. 3. As all of our swords are fully handmade, 1`2 cm differs may be existed. You can design your own sword here. Just please leave us a note about your fittings requirements and we will prepare the swords according to your needs. If some additional fee should be charged, please don\'t make the payment first when you order it. We will change the price for you and then you are needed to complete the payment. We will keep the ito and sagoe the same color. 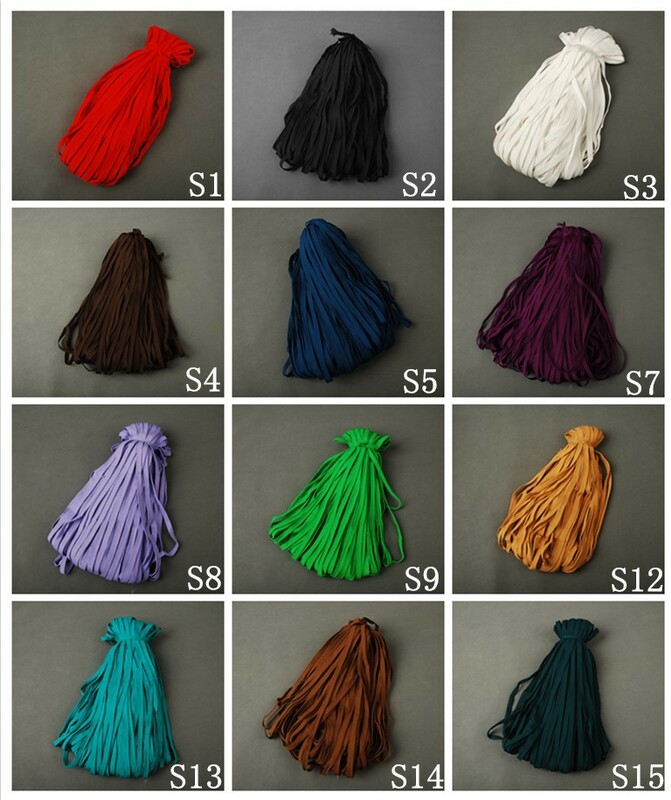 Please note us which is for ito and which is for sageo when you make the order if you want to change then in different colors. 1. Preparing Time: we need 2`5 working days to prepare the sword if there is not customization about it. More time will be needed if the sword is customized. 2. All the swords will be shipped by EMS. This is the only shipping way which can ship swords. 3. Buyers\' Information-We strive our best to provide you the most reliable, affordable way of shipping service. However, sometimes international delivery is highly depended on the courier company and local customs/duties. If you do not receive your item on time, please contact us immediately for further assistance. Please note that we do not ship on weekends, or national holidays.